There was hardly a working day when I didn't think about him and something he taught me. Vacchiano’s teaching career spanned seven decades as an instructor at The Juilliard School (1935–2002), Manhattan School of Music (1937–1999), Mannes College of Music (1937–1983), Queens College (1970–1973, 1991–1994), North Carolina School of the Arts (1973–1976), and Columbia Teachers College. In addition to his tenure at these renowned music schools, he instructed many students at his home in Flushing, New York, from 1935 to 2005. 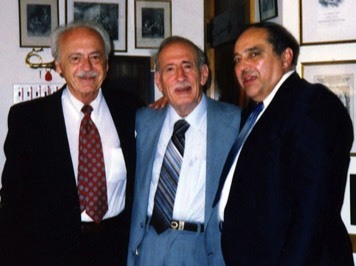 Vacchiano estimated he privately taught over 2,000 students during his entire career. The following is a partial list of former students who studied with Vacchiano and the positions they hold or held. 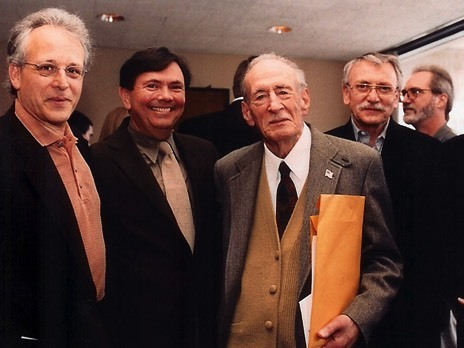 Mark Gould, Gerard Schwarz, Vacchiano, and Fred Mills at Vacchiano’s 90th birthday party at Juilliard. 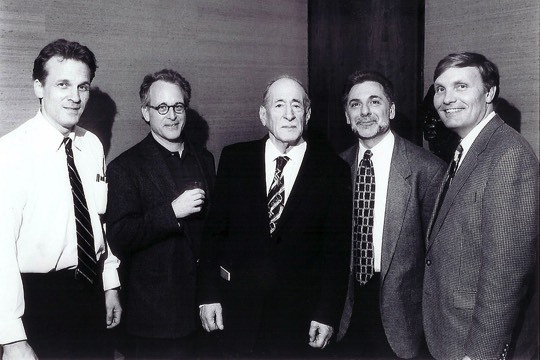 at Vacchiano’s 85th birthday party at The Juilliard School, May 1997.